Cute little eggs, lying in aromatic basmati rice cooked in coconut milk and all the exotic Indian spices makes this biriyani a total crowd pleaser. 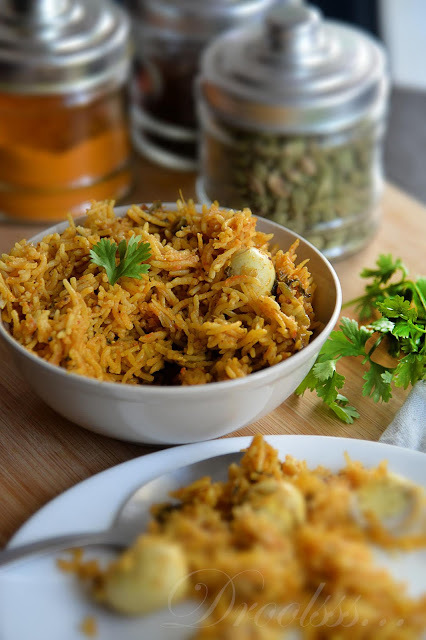 Staying quite apart from the traditional biriyani cooking methods, this biriyani is quite on the easier side as it doesn't involve the 'dum' process and moreover can be said to be a dish that can be made at a short notice too. Quail eggs or kada mutta though small and cute can never be underestimated with regard to its size. These little eggs are power packed in every sense. As these eggs are small in size, there comes a tendency to consume more of them. But the nutritional value of these eggs is 3-4 times higher than the normal chicken eggs. So though you wish to have more, it is advised not to have more though. 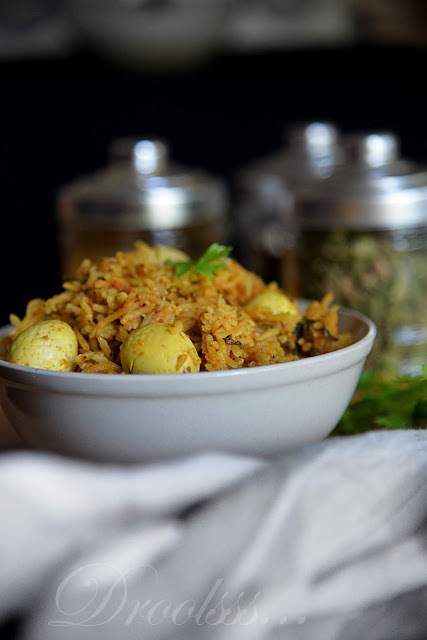 So when you make a normal egg roast or egg curry with these eggs, it is quite natural to feel the discontentment of not having as much as the heart desires to have. So then this is the way that I felt is better to have these eggs. Make a biriyani with them! Hard boil the eggs, shell them and keep aside. Soak the basmati rice in water for half an hour. Drain and keep aside. Heat ghee in a pan. Add star anise, bay leaves, fennel seeds, cardamom, cloves and cinnamon stick. Saute until a nice aroma comes. Add the onions and green chilly and fry until the onions start turning golden brown. Add the ginger paste and garlic paste. Fry until the raw smell goes. Then add the tomato puree and cook until the oil starts leaving from the sides of the pan. Add the chopped mint leaves, chili powder, turmeric powder, crushed black pepper, garam masala powder and the chicken stock cube. Mix everything well and cook on a low flame for 3-4 minutes. Toss in the boiled eggs and mix everything well. Cook for 1-2 minutes. Now add the soaked basmati rice. Mix well and saute for 1 minute. Add the thin coconut milk. Mix well. Check salt and add just as much required(As the chicken stock has salt, adjust the salt accordingly). The water must taste salty so that when the rice gets cooked the salt taste will be balanced. Allow this to boil, add the lemon juice. Cover and cook on a low flame until the water is absorbed by the rice and the rice is cooked to perfection. Switch off the heat and allow the biriyani to remain covered in the pan for 5 minutes. Then open and fluff up the rice with a fork. 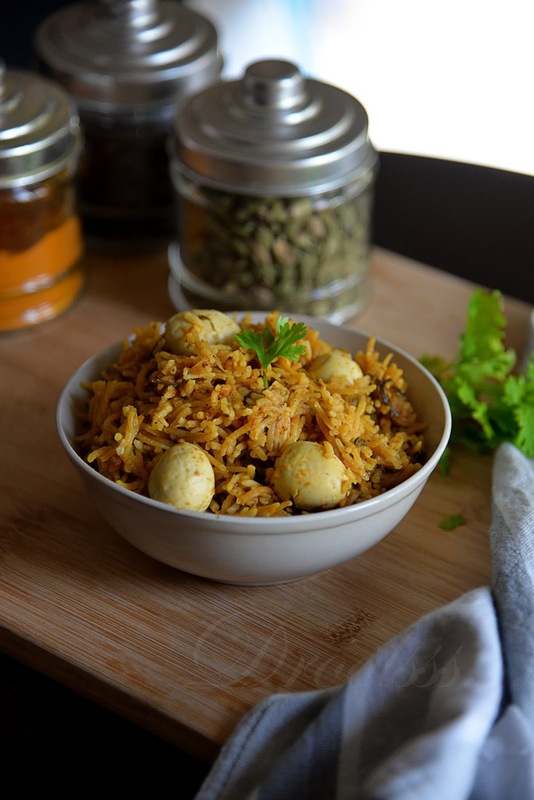 Serve the quail egg biriyani with yogurt based salads.